When it comes to equipment rental, we've got the competition beat hands down! We deal exclusively with Production Companies, Venues, and Event Professionals and provide you with the best quality gear at great prices with no hidden extras, leaving you to focus on your event! 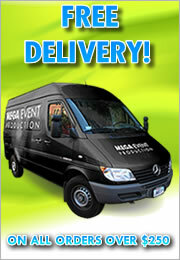 MEGA Event Productions carries only the latest equipment, including audio, video, projection, lighting, staging, truss, effects, and more! We carefully select the best quality, most reliable, and roadworthy gear available to ensure you have a hassle free rental; see some of the equipment we use on our Rental Brands page. We are one of the few Bay Area shops with certified technicians on staff to keep equipment in perfect working order. Our gear is always in pristine condition; if it doesn't look great or is broken in any way, we don't rent it out. Our sound systems feature professional grade JBL & QSC speakers and Crown amplifiers from 300W up to a 20,000W system. We have a full range of mixers available from Allen & Heath, Mackie, and Pioneer. Our video equipment includes extensive video processing gear from Barco, Black Magic, Geffen, and Kramer and a full line of Cannon DSLR Cameras and Video Cameras. We have complete video processing packages available supporting 4k video work-flows. For projection, we carry solutions up to 20k from Barco, In-Focus, Panasonic, and ViewSonic together with a full range of screens in both 4:3 and 16:9 aspect ratio. As one of the leading LED rental companies we stock over 500 up-lights and fixtures, including hundreds of IP65 outdoor rated floods. We also carry traditional fixtures from ETC including Pars and Ellipsodials, together with ETC Sensor Dimmer Racks and a wide range of power distribution gear. We are one of the largest resellers of Road Ready Intellistage in Northern California and have a full line of staging available for rental, together with thousands of feet of Global Truss. Our experience in Special Events has led us to housing a wide range of specialty items such as SnowMasters T1500 Max Snow Machines, CO2 or N2 Confetti Cannons and Confetti Blowers, High Output RGB Servo Driven Lasers, Searchlights, and many options for Fog and Haze generation. For items that we don't carry, we can take care of sub rentals for you to provide one point of billing, pickup, and drop-off. Our rental partners include Video Equipment Rentals, PSAV, McCune Audio Visuals, Musson Theatrical, Generators Unlimited, Island Creative, and Cresco Production Xpress. In addition to renting individual items, we have incredible package deals available for our most requested equipment. Each package has been carefully constructed to include everything you need to make your event a success, with highly competitive pricing and service that is second to none. We are also re-sellers for many brands and can provide competitive quotes for bids and RFP's in both the private and government sectors. From one day rentals to long term rental contracts, we offer it all. Compare our prices to other companies!